"Death of Assassin is an entertaining look at very human characters in a world on the edge of radical change." 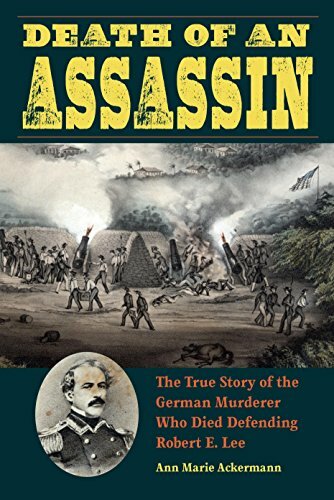 Anne Marie Ackermann in Death of an Assassin tells the story of the solving of "nineteen-century Germany's record breaking cold case" in America by "a civilian—nearly four decades after the murder." The assassination of Bönningheim's Mayor Johann Heinrich Rieber in 1835 was when "cases went cold, they stayed cold." This book is also (sort of) a "story of the birth of forensic ballistics," the first known instance of the use of ammunition striations. The killer used shotgun ammunition in a rifle in a place and time where murder by gun was almost unheard of due to government regulation. Magistrate Eduard Hammer failed to determine the "who" and "why" of the murder. A local resident finally solved the matter by a casual conversation almost four decades later and half the world away. Government controls in Hammer's Württemberg might have pointed to the killer, but the assassin failed to make the suspect list. Had Hammer identified the killer, his German Carolina law would still have requited two witnesses or a confession to convict a murderer. The author explores every such detail including even how Reverend Christopher Ulrich Hahn must have known that the killer would be at the funeral of the mayor among the mourners, and "once he dipped his quill into the ink, the curate would have to forge the right words for both." Ackermann claims that her story has "left its fingerprints on history." Coincidence is the reason for this book where the author even brings in Haley's Comet, the Canadian Patriot war, the Alamo, and so much more. The killer died in battle in 1847 in a company assigned to protecting a battery in which Robert E. Lee commanded. Lee is the most important incidental element of this story although that connection to the later great general of the American Civil War was unknown to the author when she began her research. Ackermann, however, makes such sidebars interesting and even educational. She, for example, explains that "one of the least explored aspects of the Mexican-American War in 1846–1848: the role of German soldiers." It was an "American" army of 40% to 47% German and Irish immigrants. Many Civil War buffs would also be surprised to learn that Lee, 20 years after his stellar career at the United States Military Academy, was still only a captain. The least appreciated part of history is the relevance of time. With the United States at war with Mexico, Lee finally had opportunities for advancement. He set up the Naval Battery that successfully broke the Mexican fortifications at Veracruz after fierce shelling by both sides. Death of an Assassin is a quirky crime story. Its discovery owes everything to an equally odd set of circumstances. Ackermann stumbled into this tale while writing a history of Bönningheim birding in "an unpublished forester's diary from the nineteenth century." For all of the effort to find excuses to fill space, Death of Assassin is an entertaining look at very human characters in a world on the edge of radical change. Its subjects have no clue as to that future. They could be members of any generation in any place, the ultimate incidental point in this book.